Affordable Accoutrements: What do April showers bring? I'm sorry it's been so long since my last post. Several blogging friends have been kind enough to write and ask if I've been affected by the flooding that's caused so much damage in Tennessee. Recent reports have begun calling it a "1000 year flood." I don't have a great deal to report. During the heaviest of the rains, a storm drain stopped up from the debris. It created what looked like a waterfall over a retaining wall onto the terrace. Water started coming into the walk-out basement (under the French doors and, it appears, under the outside walls). We had to move furniture, rugs, etc. Thank goodness the floors are stained concrete now and not carpeted. A large plum tree fell across the driveway. The ground was saturated, and the tree was very one-sided (leaning toward the sunny side). We'll miss the color and the privacy it provided. All in all, however, it could have been far, far worse. Well, this is supposed to be a tablescape post, so I'd better focus on the subject at hand. I ended up taking a LOT of photographs. I'll never be one of those hugely successful bloggers who post daily -- just a sentence or two and (perhaps) include one photograph. These table posts, as those of you know who've done them know, take a while to set up and photograph. It seems a waste to take dozens of pictures and then only post three or four. Feel free to scroll through them quickly or, if you're so inclined, have a nice cup of tea and take your time. We're in the dining room today, and the table is set for eight. The china and crystal are recent estate sale purchases. Flowers are from the garden. The vintage etched crystal is Rose Point by Cambridge (1934-1958). Rose Point was patterned after an imported and very expensive hand-made lace. Below is the tall sherbet/champagne. I used Cambridge Caprice bread plates as underplates for the sherbet glasses. This is the "tall water," which can be used as a wine glass. I thought the underplates would add a bit of extra sparkle. Since I was combining busily patterned dishes and stemware, I decided to keep the table covering simple. It's a poly/cotton drapery panel, casually arranged. It serves a dual purpose. It adds softness to the overall look and is easily laundered if pollen and flower petals drop from the centerpiece. In the shot below, you can see the reflective quality and translucency of the china. I think the cups' handles have an appealing shape. I decided to use 1847 Rogers Brothers flatware, Eternally Yours (1941-1973). It echoes the floral patterns of the china and crystal, but features clean, simple lines. The large dinner napkins appear vintage (but aren't). They're from an estate sale, but it was obvious they'd never been used. They're a brand Macy's carries, Charter Club, made in the Czech Republic. I like the goes-with-everything color, and the cost was only $10 for 8 (reduced on Day 2). A closer view of the cup and saucer. The centerpiece is my version of an English garden flower arrangement. I cut them the day before, re-cut the stems and conditioned in water overnight. Then I cut the stems yet again (angled cuts) and arranged them in a silverplated champagne bucket containing a block of floral oasis I'd soaked in water. The peonies have been especially beautiful this year. I was afraid the heavy rains would damage them, but they seem to have come through just fine. I also included iris blossoms, shrub roses, hydrangeas that are just beginning to bloom, and Virginia Sweet-Spire from a neighbor's shrub. She told me to cut all I wanted; it's huge! I thought the long, creamy-white blooms would add a nice "spiller" to the arrangement. And intoxicatingly sweet-smelling pink honeysuckle (less prevalent here then the ubiquitous yellow variety). I stripped away any leaves that would have ended up below the water line, but left some near the blossoms to add color and interest. Isn't it nice to be able to cut flowers from your own garden for dinner parties? They generally don't last as long as flowers from the florist, but I think their freshness and fragrance are unrivaled. One more close-up. I find the jagged edges of the peony petals fascinating, don't you? Rain was predicted, but it turned out to be a sunny afternoon. Freshly-cut rosebuds under a painting of roses. My friend, Cary, did this oil painting. The subject was the roses his sister grows. A silverplated ice bucket flanked by two Rose Point pieces, a compote (or comport) and a bud vase -- both from local estate sales. The bud vase was free! The estate sale director included it when I bought the stemware on today's table (which was half price on Day 2 of the sale). I rolled a single hosta leaf into a cylinder to line the vase. The set of china included a medium-sized platter with a well to collect gravy or juices from the meat. A simple bouquet of Sweet Spire, a candleabra, a small stack of Haviland bowls, silverplated pitchers, and a coffee pot sit atop the chest where table linens are stored. A closer view of the pitchers and coffee pot (from various estate sales). If you look through the latticework, you'll get a glimpse of the raised rose bed (the source for many of the flowers I'm using today). I could hardly wait to light the candles for you! You can clearly see the etched design in the photograph below. I love the way Rose Point sparkes by candlelight! This is stem #3121. Cambridge used the Rose Point etched design on many of their different shapes and colors. 3121 is probably the most widely available. It also happens to be my favorite of the stem shapes Cambridge produced. Even in an antique shop, Rose Point is no more expensive than good quality department store crystal. Why not purchase something that's no longer being produced and has quality that can't be reproduced by modern manufacturing methods? The etching really sparkles in this lighting situation, doesn't it? I think it's my favorite of all the glassware I've shown you on Affordable Accoutrements. I suppose it's time for a disclaimer. If this were an actual dinner party, I wouldn't use this type of arrangement as a centerpiece. I'd have either created a very low, narrow arrangement or had individual bouquets in julep cups or small vases at each place setting. The one below would be perfect for a large sideboard, on a reception table, or in an entry hall. A last look at the May flowers. I hope you enjoyed your visit. So glad you weren't washed away in the flood. Your table is very lovely. That Cambridge glass is a very favorite of mine. The candlelight just makes it all stunning. Good to hear that you are doing well without much damage. The table is beautiful and I do love that Cambridge glass. I have never noticed it before but will be aware now. Lovely! It's good to hear you came through the flood fairly well. Being from STL, we've seen the damage of floods many times through the years. I love beautiful Tennessee and could not watch the news without tears. J's 87 year old Aunt Ruth was talking about Rose Point the other day. She spent several days with us, at the lake. She is a fabulous guide on antiquing adventures. Your table is gorgeous as usual. I love the floral arrangements. Thank you so much for identifying Sweet Spire. We saw this growing in Tennessee and wondered what it was. Beautiful! So happy to hear you didn't have to much damage. This is such a beautiful tablescape (as yours always are!). Those flowers are lovely. I wish I had the green thumb you seem to have. Everything is just perfect together. Just wonderful! Sorry to hear about the flooding problems. Hopefully you will be able to save most of your art things. I have to commend you for your positive attitude! And after all that you still made time for this marvelous post. Haviland has so many beautiful patterns. Soooooooo BEAUTIFUL!!! I am addicted to peonies!! That and hydrangeas!! My favorites! The table looks divine, but honestly, I could not take my eyes off of the flowers! They are just stunning!! I am so glad to hear you didn't suffer any more damage than you did in those horrible floods! Wishing you sun and blue skies! What a mess, all the flooding water. I hope the things will dry without a lot of damage. Your table is outstanding as usual. The flower arrangement alone is gorgeous. And the china and especially the crystal is lovely. You have really the eye of an artist and the skills of a pretty good photographer to show us the details. I enjoy it always to look at your tables. This tablescape literally takes my breath away. The flowers alone are so outstanding. I always prefer "fresh from the garden" to florist arrangements. The new china is beautiful, but it is that stemware that really gets my attention. I have Fostoria Buttercup, which is lacy...but not like this. I'm sorry that you had any damage, but thankful that it wasn't worse. We love the Nashville area and have spent many weekends there over the years. We have watched in horror at what has happened at the Gaylord Opryland (one of our favorite hotels) and the losses experienced by so many. One thing about the people of TN, they will help each other bounce back. Hi Bill! Oh, I'm so sorry these things happened, but you're right - it could have been so much worse. Well, I'm glad to see you back. I've decided no one sets a prettier table than you, Bill. This one is exquisite! Your dishes, the glassware and the flowers. Oh, be still my heart - they're gorgeous! You've outdone yourself and I love seeing little glimpses of your lovely home. Just gorgeous! Your photography is amazing, as is every single element of your table. So glad you are back to blogging. So glad your flood damage wasn't too bad. Still the cleanup is a pain! Beautiful table and I love how you identify it all. Lovely! I did wonder about your situation since you had not posted in a while. I am waiting to hear from a former student of mine as to his condition. I am very impressed with the flower arrangement. I am quite fond of English garden bouquets. I would have never thought to use the Virginia Sweet Spire in an arrangement. I knew there had to be a reason why I planted them! I love the fact that I can go out in my yard-spring, summer, fall, and winter-and find naturals there with which I can use to decorate. It makes me feel very self-sufficient. Beautiful, Bill. Gee, you could have been describing our water invasion, except for the time of day. The rains swept through the backyard, over & through the retaining wall & into the garage. Fortunately, I had a stack of newspapers for recycling that I used as a dam. We had enough wet paper for a papier-mache statue! We are on a hill, so we count ourselves among the lucky. My husband was aboard the excursion train as a volunteer which became stranded about an hour east of Nashville on Sat night. Thos were tense hours until school buses rescued the 430+ passengers & crew. Beckie in Brentwood, where we are still on restricted water usage! Beautiful table, as usual. But, the flowers are breath-taking. Seems the blooms have been especially good this year in spite of the weather. Glad to hear you didn't have too many flood problems. We were lucky and had none. Except the rain did some damage to my Iris, but was able to take a couple of blue ribbons at the Milan show. As always, your table is exquisite. It's hard to come up with words to describe how much I enjoy seeing your tablescapes, and reading your commentary. It is such an inspiration. Everything in your photos is just incredibly beautiful. The etched glassware is so dramatic. You just can't have too many sets of dishes, especially when they are as classic as those Haviland. And I just adore the cups, I have a weakness for different kinds of handles on cups. I also just love the plates under the sherbets -- I would never have thought of that, and it looks fantastic. And the flowers -- what is left to say. I am on the hunt for a piece almost exactly like what you have the silver coffee set on - it's beautiful. I look forward to every bit of it. I'm glad you made it through the awful flood - many of my friends had damage of various degrees. Thanks so much for your post. Exquisite table, Bill! Just gorgeous, and I'm adore your centerpiece! It is so beautiful. Love that crystal and china as well as your flatware. You always outdo yourself! Again, I'm glad you're okay. No adjectives can possibly describe your table setting and your dining area.. I am also happy to hear you came through without too much damage. I wish and all there a speedy recovery from this tragedy. Bill -- beautiful as always! And I'm glad that your damage was minimal! That was certainly a rain!!!! I always love all your pretties! and the elegant way you set a table! Hello Bill, I'm sorry about the damage, your table is amazing, you make a very beautiful English garden centerpiece. Beautiful table, Bill. I love your recently purchased china. The bouquet is lovely and I like the Sweet Spire in the vase on your buffet. It looks quite nice alone!! So glad to hear you didn't have much damage but I am sure you are going to miss that plum tree. It is all so beautiful! Quite magical, especially at night! Love all your floral arrangements and the lovely new china! So glad to hear you are okay and surviving the damage from the floods. I always enjoy your posts! Bill, Your table is beautiful, as always, but it's the floral arrangements that I love! Absolutely stunning! Well done Bill! First of all, I'm so happy to hear that weren't dramatically effected by the flood. I must admit I was getting a bit worried from your lack of posts. I am truly in love with your tablescape. I LOVE your Rosepoint crystal and have always loved. I just never see it around. I have a footed candy dish, a divided candy dish and a vase in Rosepoint, but would LOVE LOVE to have a set of crystal. And then when I got done drooling over your crystal, your centerpiece put me over the edge. It is an amazing bouquet, but what is truly unbelieveable is that they are from your garden. Oh my gosh, Bill...I'm jumping up & down in my chair! I think this has to be my most favorite post of yours yet. LOVE the stemware...no, I mean SERIOUSLY LOVE IT!! The flowers for your centerpiece are spectacular. (here, I thought mine were pretty...HA!) They look especially pretty with the pinks in your rugs. Oh, I'm just in awe of how wonderful this whole scene looks. It looks like a dream from Cinderella dream, so soft & beautiful!! Oh and " I think it's my favorite of all the glassware I've shown you on Affordable Accoutrements." Mine, too!!! Opulent...that's the word I was searching for!! What a beautiful table setting!! Love the flowers. Thank goodness you didn't have a lot of damage to your home and things will get back to normal soon. Love the table, everything is just beautiful!! !I absolutely love the glassware and the silverware is very pretty too. Incredible! The flower bouquet is stunning! I really love that stemware; I agree it is the prettiest of the stemware you have shown. 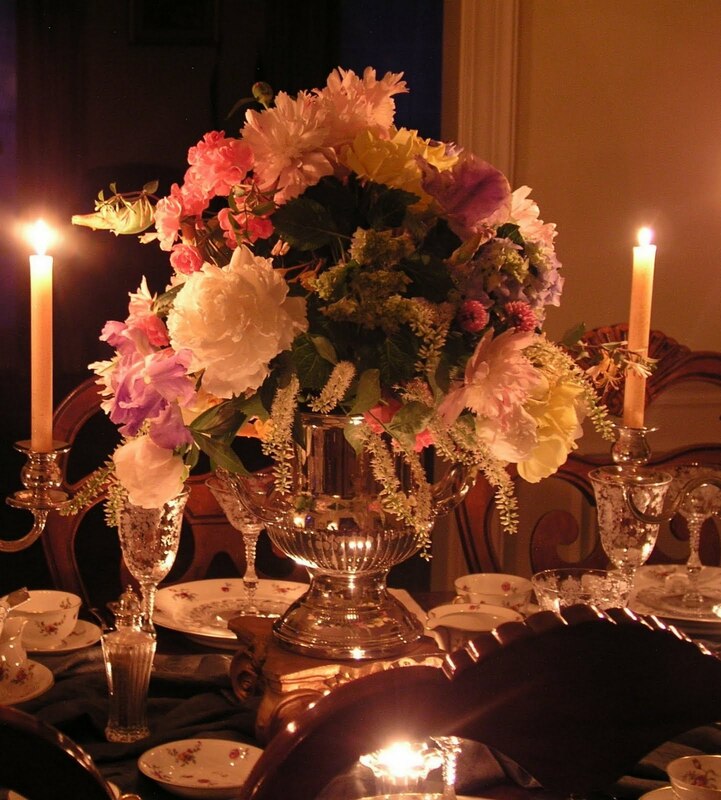 The lacy rose pattern is exquisite and really looks gorgeous in the candlelight. Hey Bill, good to see you. I was waiting and waiting, scrolling down the photos and shazam there it was...the blue hour. Love it. Your friend's painting is gorgeous. Hi Bill! Your table is beautiful, as always. I especially LOVE the floral centerpiece. Peonies are among my favorite flowers...and I cannot grow them here in coastal FL. I am so pleased to know that your home sustained minimal damage. I was thinking of you and my other friends in the Nashville, Franklin area. I think this has to be the most beautiful of all. The centerpiece is spectacular and the crystal is just absolutely exquisite. I love the china and the handles on the cups are very special. I had to scroll through twice my friend. I'm so happy to hear that your flood damage was minimal, thank goodness the alarm went off when it did. What to say about your tablescape that everyone else hasn't already said, there are no superlatives left. Your table is just gorgeous! You are a fabulous floral arranger. The flowers are the crowning touch. Love the china and the etched glassware, it just sparkles! Kudos to you ! Bill, I'm so glad the flood didn't do any more damage to you than it did. The table is too beautiful for words! I always say that every table you do is 'my favorite', but this one is!! The flowers are stunning. You should publish a tablescaping book! Think about it! I always enjoy perusing your tablescapes. I learn so much. Your bouquet is gorgeous today, so spring like. Almost a shame to go to candlelight with such brilliant colors. I'm gald to hear you had minimal damage to your home. Truly amazing! I envy your gardens..And the stemware is just wonderful! I am sorry for the damage you had, but thankful it wasn't worse..I know it is always difficult .. Thank you for treating us to that table! With all you have going on, you were still able to create a Spectacular Setting! Tres Magnifique! First and foremost, thankfully you had minimal water damage. One of the most beautiful tablescapes ever, style and class all the way. I totally agree with Holly that you should publish a book. Glad to hear you didn't experience severe damage. What a dramatic entrance back into Tablescape Thursday. The stemware is fantastic. Your photography captured the brilliant details perfectly. I love the floral centerpiece. If I were one of your dinner guest, I would insist you leave it. Who needs to look at other guests from across the table when you have such a spectacular centerpiece in front of you:-). I love the silver pitchers and coffee pot. The entire setting sparkles. Thank you for sharing your gift. Your table is breathtaking. The centrepiece is just beyond words. The whole diningroom just reminds me of the english country house style at its best. I don't know whether I like the peonies or the Rose Point better - and you know me with Rose Point! Our peonies are full of buds but won't flower until the end of this month. And yes, you got a phenomenal bargain with the Rose Point. A lovely table as always. I remember our silverware when I was a child was Eternally Yours and we used it for every day and every other day. I wish now I had it but I don't know what happened to it. My Mother was a true southern belle, one of 10 children who lived a wonderful life as a well brought up daughter, but then she married my Dad and times were always hard, but she could still set a table with odds and ends that would take your breath away and they loved each other with a passion scarcely seen today. I don't know why I am rambling on but your gorgeous tables always remind me of her. Wow! Those flowers are stunning! The arrangement instantly caught my eye. Just lovely! Noticed you missing, glad everything is ok! Oh what lovely, lovely flowers from your garden! This is a beautiful table set before us -- love your stemware especially. So glad that you've made it through the storm and don't have to tablescape underwater. Hi Bill! Wondered where you have been! Hope all is ok. I gave you a mention last week in my blog. Everything is beautiful as usual! Love the flowers and the rose china is very lovely!! Bill, I never tire of looking at your beautiful photos. I always enjoy the way you capture your table settings at different times of the day and how the light plays off of everything. This table is delightful, but it is the flowers that really caught my eye. I'm in awe that these are from your garden. They are gorgeous! Bill, I had to come back by to see your beautiful flowers again. I adore the table, but you just knocked yourself out with that arrangement. I can't believe they came from your yard! What paradise! And those Va. Sweet-Spires (is that the name???) are fabulous. I want to move to Tennessee after this! I adore flowers, and English garden flowers are my favorites. I have to settle, though, for what the grocery store or florist has to offer which can get pricey. Oh, to be able to walk in the yard and just pick these! Enjoyed my visit, and I hope you'll drop to see me if you get a chance. I'm not you when it comes to fabulous photography, but I gave it my best shot! LOL! Bill-you certainly were missed. you have many blessings coming your way. You are so talented.-you need to publish a book or have your own column in a magazine . Even down to wrapping a hosta leaf in the vase to hide all the stems-what a polished look. Amazing and beautiful - what a pretty table! Okay, Bill, I'm ashamed of myself. I think I just hinted at stealing your crystal. I would never do that! I would be happy just to sit at that beautiful table and look around me. You do have an amazing gift for combining beautiful elements is such a way as to be pleasing to the senses. I loved the way your china, crystal, flatware, and floral centerpiece all worked together. It is as if you put the pieces of a puzzle together and ended up with a Van Gogh! You should consider putting a book together. I would buy it! I am happy that the flood damage was not worse. But a lot of work none the less. YOur table is exquisite, as usual! YOur china is beautiful and sweet and delicate. I love the gold painted handles of the tea cup. And it is paired perfectly with the crystal. I am also so fond of etched crystal. The icebucket pails (PUN) in comparison to the beauty of your cut flowers. What a mix of the prettiest floweres I ever did see. ANd I have never seen PINK honeysuckles! I can almost smell all of the floweres from here! Bill, you are a master! Good Lord, Bill! ALL OF THIS IS GORGEOUS!! It's Midnight, and I don't even have the time/I am so tired at this end of the day, to comment on ALL OF YOUR BEAUTIFUL items in this post!!!!!!!!! My goodness, I could comment on a hundred things, you are so talented in putting all of this together. This is an vague comment, so I apologize, and I WILL write with a more coherent, detailed comment when I get some time/am more awake; but I DID want to take a moment to AT LEAST say how beautiful everything looks! So thankful your home didn't receive alot of damage. I always debate whether we should have flood insurance being very near a lake, but we're not in a flood zone. Your flowers are gorgeous! They are so pretty, they almost look silk. I can only imagine how wonderful they must smell! That stemware and flatware is gorgeous! I've been on a new kick recently of collecting people's silverplate/silver cast-offs and was thrilled to see I have the same ice bucket and the rear teapot that you have. (They must be good finds if you have them! ;o) I wish I could Estate Sale shop w/ you. You find the BEST STUFF! The floral arrangement and the Rose Point glasses are gorgeous! May I ask what type of camera you used? The photos, especially the ones taken after dark, are professional quality, Bill. Beautiful tablescape! It is all so beautiful!! I love it! I am definitely inspired. I am sorry to hear about all of issues regarding the weather. So many have lost so much. Your table is absolutely lovely. The stemware is drool worthy! And your flowers are gorgeous. The china is so sweet and delicate. Wow Bill, I did indeed take my time, and savored every photo of your tablescape. I particularly am fascinated by your lovely floral arrangement from your garden. I cannot believe the rains didn't damage them. You have such a knack for putting it all together: dishes, crystal, flowers--the whole thing is just wonderful. I love that you take your time assembling it all and photographing it too. Your photos really reflect your eye for design. I agree, why put all that energy into creating a tablescape and not photograph the heck out of it. Glad you didn't have a lot of damage from all the rain. Gorgeous glasses and fresh flowers! I also love the many moods you set when taking photos at various stages of evening...the candlelit shots are superb. Welcome back, Bill. I'm sorry to hear about the flooding in your basement, but I'm glad it wasn't worse. Your poor neighbors! This is one of the prettiest china patterns I've seen yet. It's so dainty and delicate. Your centerpiece is gorgeous, even though it's just for "show". The stemware is stunning, and overall this tablescape feels so romantic and nostalgic. You'd never guess you've been dealing with a flood. You bounce back well, my friend! The floral arrangement you created is stunning! The color and texture is prefect! I look forward to exploring your blog for more inspiration! Dear Bill, your table is very beautiful as always, but aprt from the pretty china set, my favourite has to be the flowers; my heart skipped a beat at first sight. Very English, my friend :o) So glad you're still with us. I am so glad you are okay after the flooding it is an awful feeling when water is coming in your home. I loved your tablescape. Another wonderful treat. If you lived near me I'd invite you over all the time. Don't worry I am 73. This post is so beautiful..It made my day. Bill... I love you still and I always will...somehow the Fifth Dimension just flew through my head!!! Thanks for sharing all your talents with us. Love everything! Hi Bill! Wow, your garden must be amazing! I love all your gorgeous flowers! The Haviland china is so pretty...but the crystal is absolutely stunning! Beautiful! So sorry about all your flooding woes...glad the damage wasn't any worse. I hope it was a 1000 year flood and your neighborhood doesn't see anything like this again! Your attention to detail is so great. Not only is the table lovely, but the entire rest of the room goes so well with it! Welcome back Bill, and you greet us with another beautiful table. I adore Rose Point and someday I will begin my collection. It is just so delicate and romantic. Your flowers are also a star at your table. Virginia Sweet Spire, so that's what it's called. I have a bush of the lovely by the stream just past a row or Bridal Veil. I love the jagged pale pink and white peony with the fluffy center and have been looking for a pot at my local nurserys. I had a few of these bushes at the first house I ever owned as a newly wed many years ago. It's an old fashioned peony and I still adore it. Your bouquet is so pretty. Thank you for sharing. Bill, The flowers are fabulous! You must show us your garden some day! I know it is fabulous! I really like the Rose point, but what I like the most is the crystal - Wow - Wow - Wow!!!! It is amazingly beautiful. So glad you are back and I'm sorry you had to deal with the flooding but glad it was no worse than it was. You take care now. Looking forward to your next post. How generous of you to create such a beautiful post despite the unfortunate events. I hope all is well for you and your neighbour. Your crystal is so beautiful, but the flowers, oh my! They are so pretty, the overall look is so soft, which I find divine. The prettiest arrangements, so often, are home grown flowers, there's just no beating them!! Thanks for the inspiration. absolutely beautiful, I love the history behind this home. It kind of makes me wonder about our own family history. Since we are immigrants to the US, our family roots in the US go back to only the 50's. The rest of our family history is in Mexico and Spain.